State is a variable typeface whose styles are inspired by human emotions. The typeface explores the new variable font format, an innovative technology that allows the user of a typeface to control the style of the font by using a set of sliders. The three axes of State are Greed, Pride, and Anger. Each axis consists of a pair of opposing emotions: desired and fulfilled for Greed, shy and confident for Pride, and calm and angry for Anger. A neutral type style—free of emotional expression—appears when all three axes were set in the middle. State does not only provide a specific form of these emotions but also produces the ranges of emotions in between and a mixture of them. Variable typefaces are establishing a new relationship between type designers and graphic designers. You can try the Variable Font feature at the State website. Drawing process to make a variable font. Printed out proofs of each style drawing of State. I drew 10 styles in total to make this typeface work well with variable font format. Diagrams show variation generate from three axes of State; Greed Pride and Anger. Vector drawing of Greed Axes, which control desired and fulfilled emotions. ‘G’ and ‘a’ are control characters for these two font styles. This image shows the growing of Greed’s axis. Styles generate by only Greed axis. Vector drawing of Pride Axes, which control shy and confident emotions. Stack of Greed and Pride axes growing (Greed 0-200, Pride 0-200, Anger 100). Styles generated by Greed and Pride axes. Vector drawing of Anger Axes, which control calm and angry emotions. Stack of Greed and Anger axes growing (Greed 0-200, Pride 100, Anger 0-200). Styles generate by Greed and Anger axes. 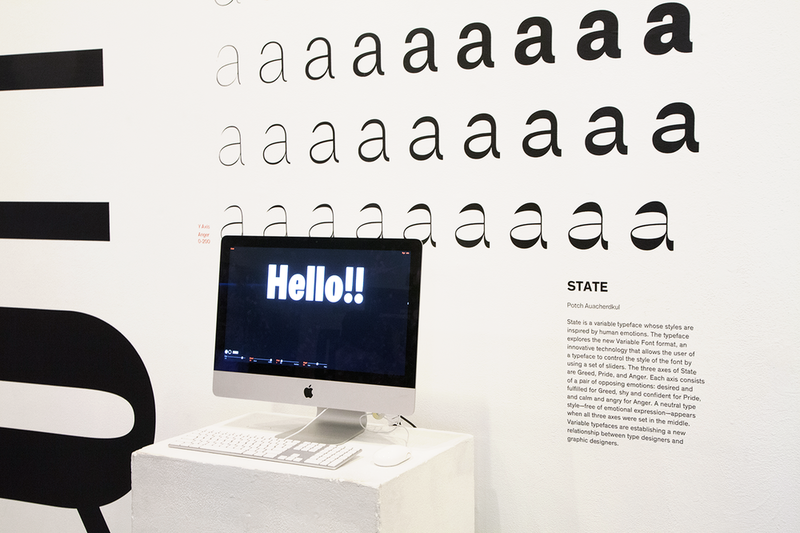 My installation displayed many of variations of State typefamily also indicate how to generate each style that display on the wall. I’ve installed an iMac which allows audience to play with Variable font also sharing the screen to the flat screen. You can try Variable Font feature at State website.